The former Mount Polley tailings dam	(www.vancouverobserver.com). A group of friends is enjoying a picnic on the bank of a pleasant river surrounded by woods. Birds are singing and there is a faint whisper from the breeze in the trees. The idyll is shattered when one of the friends shouts, “There’s a baby in the river!” He jumps in the river and wades out to the still-struggling infant. As he is wading back to shore with the infant, another baby floats down toward the group. A second person jumps in to rescue it. But there is another one, and another one, and soon the whole group of picnic-ers is in the river, rescuing babies, bringing them to shore and wading out to catch the next one. A woman, hiking by on the shore, stops to survey the scene, and then continues upstream. “Please help us! We’re exhausted,” shouts one of the group. Okay, that’s a little dark. You’ve probably heard the story before in other contexts, too. But it’s a great metaphor for the efforts to clean up the St. Louis River estuary while potentially permitting new sources — potentially catastrophic sources — of pollution of the St. Louis upstream. What could possibly go wrong? Well, a lot. We ought to ask the residents downstream of the Mount Polley mine and tailings dam in British Columbia. They probably have a useful perspective. 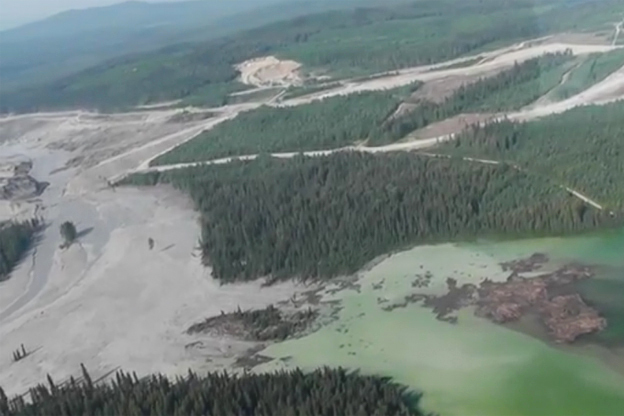 You know the Mount Polley story: a state-of-the-art mine with a state-of-the-art tailings dam that dumped a state-of-the-art load of toxic heavy metals into the Fraser River, one of the Pacific Ocean’s most prolific salmon fisheries. “It was a loaded gun,” said the B.C. Mines Minister. You’d probably be interested to know that the same firm of bright lights who designed the dam at Mount Polley are consulting with Minnesota on the design and safety of the tailings dam and basin that PolyMet wants to use. Interested, and maybe alarmed, too. The environmental group American Rivers had designated the St. Louis River, the largest tributary to Lake Superior, one of the ten most endangered rivers in the country. Imagine a company so magisterial that it has external affairs. A little big for its britches, perhaps, when one recognizes that PolyMet was organized (or maybe “organised” in this case) as Fleck Resources, in 1981, and has never turned a spoonful of dirt or made a dime since. We are poised to permit this bunch of high plains drifters to put enormous natural resources of the state at risk. In the 1970s we listened to Reserve’s corporate promises that it wasn’t necessary to quit dumping millions of tons of taconite tailings into Lake Superior. This waste disposal was, we were assured, not a threat to the environment. And did not the company provide many good jobs? I was among those who attended a company news conference. Researchers were supposed to prove “no harm” would come from the plant’s refuse being dumped into the deep water next to the plant. The demonstration included small, aquarium-like, water-filled tanks. Dramatically, tailings were dropped into the glass-sided containers. We were told to note that all the particles sank to the bottom. It was proof, they said, that pesky environmentalists were wrong and should back off. Though suffering derision and verbal abuse, even veiled threats to their safety, they persisted and won. Glen did not report that the Reserve people drank the water.